We all have goals in life. Each one of us wants to achieve something, whether great or small, at some point in our lives. We have deep-seated hopes and dreams for the future and a burning desire to accomplish some great feats. It’s stitched into the very fabric of our society, woven into the core of who we are, deep down inside. It’s emblazoned in our DNA, genetically pre-dispositioned, not just for mere survival, but also with a yearning passion to thrive. In fact, it’s part of what’s made us as a culture into who we are. Our species has more than just survived; we’ve quite literally thrived, achieving outlandish results thanks to the wild-eyed innovations that have sparked the possibility to make the seemingly impossible a reality in our lives. Not only have we wished for the moon, but we’ve also shot for the stars. Clearly, we’ve achieved some tremendous goals in life. Across the planet, we’ve accomplished what was once thought to live only in the realm of human imagination, or merely the topic of science-fiction fantasy. Yet, while our society and culture seem to be making astronomical leaps forward and achieving outlandish goals, as individuals, we find it harder to see things through when it comes to our personal goals. Most people associate the setting of their goals with one day in particular — New Year’s Eve. It’s a time for a fresh start. A chance for a clean slate. But those who set goals on New Year’s Eve don’t typically see them through. In fact, according to one study by the University of Scranton, only eight percent of goals set on New Year’s Eve are actually achieved. That’s a 92 percent failure rate, which is pretty sickening and disheartening when you think about it. But that’s also because most people who set goals on New Year’s don’t set them the right way. You can’t expect to achieve your goals when you go about it all wrong. This runs contrary to any recipe for goal-setting success that’s out there. Why is that? Because setting goals on New Year’s Eve, or any other day for that matter, can’t be done arbitrarily in the mind. The goals can’t remain in the abstract. They have to be materialized and defined with a high degree of specificity. And they need to be planned and acted upon in the right way. That might be why 34 percent of people give up on their New Year’s goals after the first month. After 6 months, 54 percent have fallen off track and given up. The odds are stacked up against us because we’re not setting goals the right way. When you follow a proven plan for setting and achieving your goals the right way, you’re more likely to see things through. However, moving beyond that, there’s a proven system for achieving any goal. It involves seven separate steps and a system called SMARTER goal setting. SMARTER goals, an acronym, will allow you to achieve nearly anything your heart desires. It allows you to breakdown the process into distinct steps, doing a little bit each day towards the attainment of your dreams. The first step in the SMARTER method of goal setting is to get highly specific about what you intend to achieve. You have to ensure that it’s measurable so that it can be tracked, but you also have to put a great deal of detail into what it is you intend to achieve. You can’t just say you want to be rich. It doesn’t work that way. You quite literally have to describe the goal and your life in a great deal of detail. If you plan to lose 50 pounds in the next 12 months, describe what your day looks like by the time you reach that goal. What’s your waist size? What kinds of clothes are you wearing? What time are you waking up to work out? What types of foods are you eating or avoiding? The more specific you get, the better. Goals can’t just be specific. The second step for achieving your goals is to ensure that they’re meaningful. We will always do more to achieve a goal that has a deep-rooted meaning to us than we will to achieve something that’s superficial. So, if you want to have a million dollar net worth because of the status it affords, you can forget about your chances for success. Instead, if you have money goals, and you associate a deep enough meaning to them, then they’re more likely to be achieved. You can’t just want things for the sake of wanting them. You can’t just want to lose weight or make more money because those are goals you’ve always wanted. Why have you always wanted them? We will always do more to achieve things that are deeply meaningful to us. When those meanings involve things like family, freedom, security, country and love, we’ll go out of our way to see things through. We won’t throw in that proverbial towel and give up after we hit a few stumbling blocks or fail repeatedly. Take a moment to write down the meaning that you’re associating with your goals. Dig deep. It has to be a profound meaning. It has to be something that you’re willing to sacrifice everything for. Write this down on a piece of paper or a screen. This is one of the most important steps in the process. 3 (A) — Pick goals that are (A)chievable. I’m all for picking lofty long-term goals. Ten years down the road, we can achieve anything as long as we work hard during that entire period. But, when it comes to your one, two and even three-year goals, ensure that they’re achievable. Don’t say that you’re going to make a billion dollars in 12 months if you’re currently heavily in debt. When you pick goals that are achievable, not only are you more likely to achieve them, but you can also develop some momentum in the process. It’s exciting to accomplish a goal that is currently out of reach, no matter what that goal is. Once you get there, you’re fueled by the zeal and enthusiasm of reaching your goal. 4 (R) — The goals must be (R)elevant. How relevant are the goals that you’ve selected for your life and your future? Are they aligned with who you are? Do they resonate with your core values and beliefs? Or, do they go contrary to everything that you believe in? When we pick goals that go against the grain of who we are, we find it much more difficult to follow through. What we believe in are also the product of things we’ve heard while growing up. Things like “money doesn’t grow on trees,” or “more money, more problems,” and “all men cheat and lie,” and so on, become ingrained in our minds, influencing our every thought, emotion and resultant behavior. Take the time to jot down the things that make you into who you are. Then, pick relevant goals that are in harmony with what you believe in and value. You’ll find your goal-setting journey to be much more harmonious and fluid when you pick relevant goals to your life and who you are deep down inside. 5 (T) — Make sure the goals are (T)ime-bound. Goals must be time-bound in order to be achievable. When do you plan on achieving this goal? Don’t just say you want to get rich in the future or make a million dollars in the next few years. You have to pick a date on the calendar if you’re serious about achieving that goal. Select an actual date on the calendar for your specific goal own to the very day of the week. When your goal is specific and measurable, it’s trackable. When you give it a real date on the calendar, you can break it down into monthly and weekly goals. 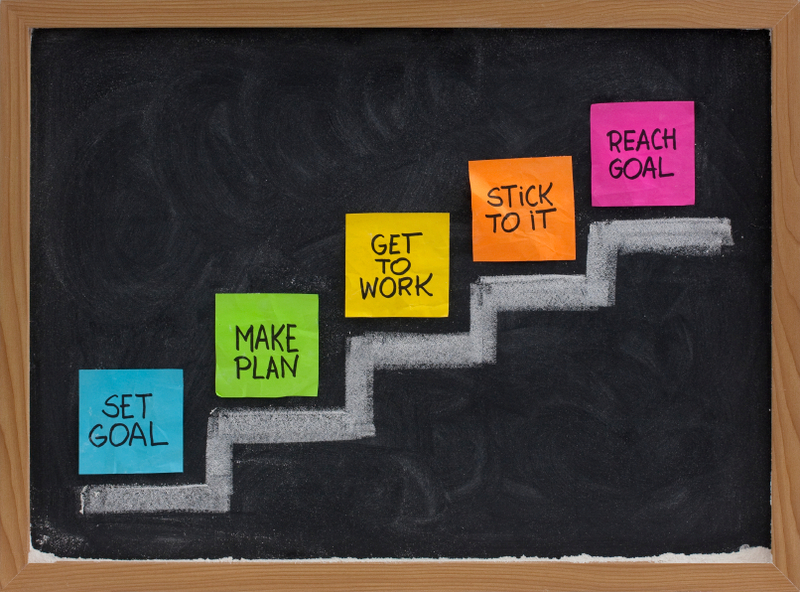 This way, you can chart your progress to determine how far or close you are to achieving that goal. For example, if the goal is to lose 50 pounds by June 1 of next year, and you have 12 months to achieve that goal, you could easily break it down into 4.16 pounds of weight loss per month. Per week, you’re looking at roughly 1.04 pounds to lose. Go even further to a daily basis, and you’ll notice how this seems more and more achievable. However, you can’t do this unless the goals are time-bound. Pick the date on the calendar, and write it down as part of your goal. Circle the date and setup reminders with your phone on a weekly or monthly basis. Then, do whatever it takes to achieve it. 6 (E) — You have to (E)valuate your progress along the way. When goals are time-bound, they can be evaluated, allowing you to track your progress along the way. The more meticulous you track your goals, the more likely you’ll be to follow through. Pick a system for tracking your goals, and do it every single day. This will give you a barometer towards success. For example, when a plane takes off from LAX, traveling to JFK, it evaluates its progress along the way. It knows, at any given moment of its journey, just how far it’s come, where it is and what’s left to go. It knows the direction to travel in, the wind speed, the plane’s speed, potential disruptions with air-traffic congestion or storms, and much more. When you evaluate, you get a better lay of the land. When you fail to chart your progress, it’s easier to ignore things and you’re more likely to revert back to detrimental patterns and bad habits. Chart your progress every single day if you want to achieve your goals in the long term. 7 (R) — Always (R)e-adjust your approach to reach your goals. If you evaluate your progress, and you realize that you’re getting further away from your goals rather than closer to them, you can re-adjust your approach. This gives you a moment to correct things. You might not notice this if you fail to evaluate your progress on a daily basis. When a plane sees that there’s a storm or air-traffic congestion, it can adjust its approach to reach its intended target on time. If there’s major turbulence ahead and it needs to veer slightly off course, it knows what to do in order to correct that so it can make up for the time lost and to ultimately reach its destination. Our goals are very much like an airplane’s journey. We’re trying to reach our final destination, and in order to do that, we need to be clear about what that destination is and when we’ll reach it. Then, all we need to do is plan, take action and to modify our approach along the way in order to get to where we’re going in the long term. Simple sounding, but clearly far harder to implement.